6 Marlborough is located on the south side of Marlborough, between Arlington and Berkeley, with 4 Marlborough to the east and 8 Marlborough to the west. 6 Marlborough was designed by architect George Nelson Jacobs and built in 1924 as a five-story (plus basement), 21-unit apartment house. 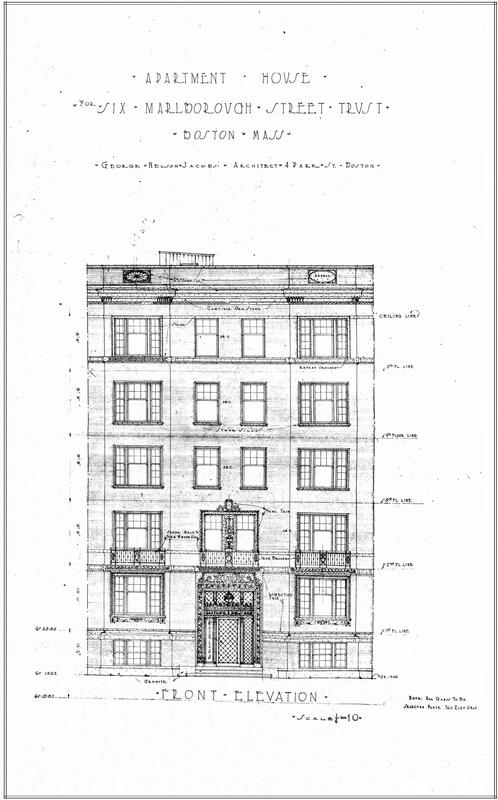 The 6 Marlborough Street Trust is shown as the owner on the original building permit application, dated September 15, 1924. Architectural plans for the building — including elevations, floor plans, and foundation plans — are included in the City of Boston Blueprints Collection in the Boston Public Library’s Arts Department (reference BIN F-7). Click here for an index to the deeds for 6 Marlborough. On October 30, 1924, 6 Marlborough was purchased from Edward Wyner by real estate dealer Samuel Altman. He subsequently entered into mortgages and was the owner during construction. At about the same time, he also was associated with Edward Wyner in the construction of a new apartment building at 100 Beacon (in the mid-1920s. Edward Wyner began construction of the Ritz-Carlton Hotel at 15 Arlington, which he subsequently would own and operate until his death in 1961). On August 28, 1925, Samuel Altman transferred 6 Marlborough to Harry Farelle (shown as Harry FaRelle in the deed records). The new building was occupied by the spring of 1926. In the early 1930s, Harry Farelle failed to pay the property taxes due on 6 Marlborough, and on January 9, 1934, the City of Boston took title to the property. On February 12, 1935, the Fitchburg Savings Bank foreclosed on its mortgage to Samuel Altman (who had died in September of 1931) and took possession of the property. On February 21, 1935, 6 Marlborough was acquired from the Fitchburg Savings Bank by Franklin Investments, Inc. Real estate dealer Frank Herman Baer was treasurer of Franklin Investments. He and his wife, Lena (Rudnick) Baer, lived in Brookline. On May 2, 1935, the City of Boston released its claim to any interest in the property, presumably having been paid the back taxes and penalties owed. Frank Baer died in January of 1950. On December 27, 1950, Franklin Investments transferred the property to Lena Baer, president of the firm, and on December 10, 1958, Lena Baer transferred the property to herself as trustee of the Ware-Marlborough Trust. On January 6, 1969, 6 Commonwealth was acquired from the Ware-Marlborough Trust by Eva Stern, who conveyed it on the same day to Thomas Francis Keating, Jr., and his wife, Doris J. (Borasch) Keating, trustees of the Six Marlborough Trust. In August of 1969, they applied for (and subsequently received) permission to increase the number of units from 21 to 23. Thomas Keating died in January of 1996. On August 21, 1996, Doris Keating, as the sole surviving trustee of the Six Marlborough Trust, transferred the property to the Keating Holdings Limited Partnership. On May 12, 2006, 6 Marlborough was purchased from Keating Holdings Limited Partnership by the Six Marlborough Street LLC (Stig Leschly, authorized representative), and on January 18, 2007, it was purchased from the Six Marlborough Street LLC by the Marlborough Kevin LLC (National Safe Harbor Exchanges, Inc., manager of record). 6 Marlborough remained an apartment building in 2015. The original townhouse at 6 Marlborough was designed by architect Nathaniel J. Bradlee and built ca. 1864, one of two contiguous houses (6-8 Marlborough) built for Frank William Andrews, a real estate investor and former importer of iron and crockery. He sold 8 Marlborough and retained 6 Marlborough as his home. The land on which 6-8 Marlborough were built was a combination of two lots: one with a 25 foot frontage on Marlborough to the east which had been acquired from the Commonwealth of Massachusetts by Dr. John Homans on December 9, 1858, and a second, to the west, with a 40 foot frontage acquired from the Commonwealth by Frank W. Andrews on February 27, 1860. John Homans and his wife, Caroline (Walker) Homans, lived at 11 Arlington. On January 2, 1862, he sold his lot on Marlborough to Horace Jenkins and William Carpenter. Frank Andrews bought it on April 21, 1863, and combined it with his lot, creating a 65 parcel which he subdivided into a 43 foot lot for his house at 6 Marlborough and a 22 foot lot for 8 Marlborough. Frank Andrews and his wife, Maria Frances (Adams) Andrews, lived at 6 Marlborough and also maintained a residence in Newport, Sunset Ridge, designed by H. H. Richardson. His parents, William Turell Andrews and Fannie Mackay (Reynolds) Andrews, lived with them at 6 Marlborough. William T. Andrews was a real estate investor and president of the National City Bank. Both families previously had lived at 12 Ashburton Place. In about 1870, Frank and Maria Andrews moved to 187 Beacon. 6 Marlborough remained William amd Fannie Andrews’s home, and on November 10, 1873, he purchased it from his son. William Andrews died in November of 1879. Fannie Andrews continued to live at 6 Marlborough until her death in April of 1881. On June 15, 1882, 6 Marlborough was acquired from William T. Andrews’s estate by Mrs. Pauline Elizabeth Augusta (Agassiz) Shaw, the wife of mining investor Quincy Adams Shaw. She and her husband lived in Jamaica Plain and maintained home, The Commons, in Pride’s Crossing. Pauline Shaw was the daughter of noted zoologist and Professor Jean Louis Rodolphe Agassiz. She was active in the women’s suffrage, peace, prison reform, and kindergarten movements. She is credited for underwriting thirty kindergarten schools in Boston and for aiding numerous schools and progressive organizations, including founding the North Bennett Street Industrial School in the North End in 1885. Pauline Shaw opened a private day school at 6 Marlborough designed to provide an education to her own children and to the children of families in the neighborhood. It was considered one of the most progressive schools in Boston, co-educational through all the grades and a leader in innovative curricula and methods. In April of 1889, she acquired 8 Marlborough, next door, and used that building as an extension of the school. It also became the residence of Miss Isobel Louisa Briggs, the school’s principal. By the 1894-1895 winter season, 6 Marlborough was the home of real estate dealer Charles W. Crosse and his wife, Sarah H. (Robbins) Crosse. They previously had lived at 195 Huntington. Charles Crosse died in January of 1897. 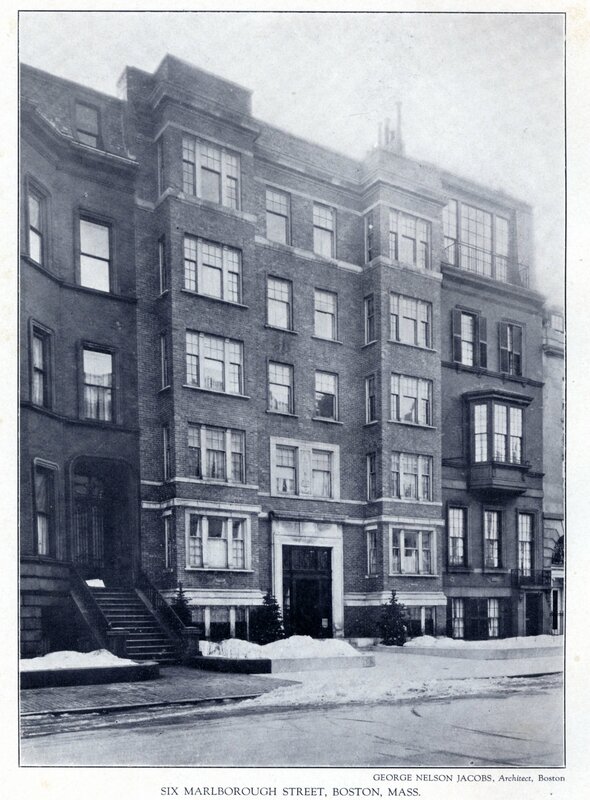 Sarah Crosse moved soon thereafter to 845 Boylston and by the 1899-1900 winter season was living at 425 Marlborough. 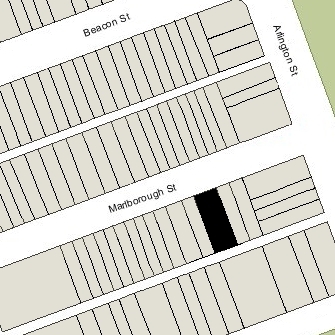 6 Marlborough was not listed in the 1898-1900 Blue Books. By the 1901-1902 winter season, 6 Marlborough was the home of Miss Marie T. Hersey. She previously had been a lodger at 23 Marlborough. She continued to live at 6 Marlborough during the next season, but moved thereafter. By 1904, Mrs. Shaw had made 6 Marlborough the headquarters of the Massachusetts Woman’s Suffrage Association. It continued to be located there in 1909, but had moved to 585 Boylston by 1910. 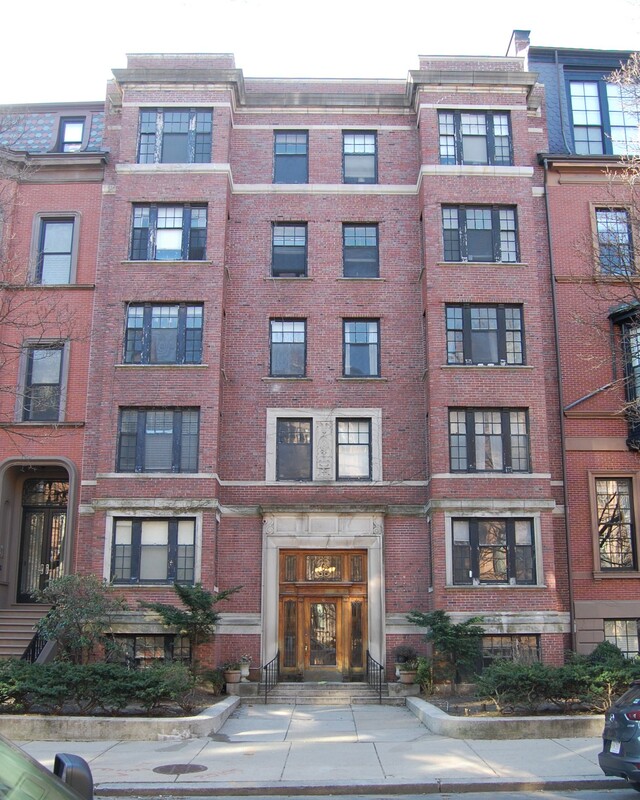 6 Marlborough was not listed in the 1910-1914 Blue Books. By 1915, it had become the headquarters of the Women’s Municipal League of Boston. The League continued to be listed located there through about 1917. Pauline Shaw died in February of 1917. In June of 1917, 6 Marlborough was acquired from Pauline Shaw’s heirs by her grandson, Louis Agassiz Shaw, Jr. He and his wife, Joanne (born Anna) Child (Bird) Shaw, made it their home. They divorced in July of 1918, and she remarried in September of 1919 to attorney Arthur L. Johnson. Louis A. Shaw was a physiologist. In 1918, he joined the faculty of Harvard Medical School as an instructor in physiology and later would become an assistant professor at the Harvard School of Public Health. In 1928, he collaborated with Philip Drinker in developing the first widely used iron lung. On April 28, 1921, 6 Marlborough was the subject of a “raid” which resulted in the seizure of an illegal still and liquor, in violation of Prohibition. On May 20, 1921, the Boston Globe reported that the US Commissioner had dismissed the criminal charges against Louis Shaw because the search warrant was defective, but had refused to return the still and liquor, deeming them “contraband.” On June 16, 1921, the Internal Revenue Service placed a lien against 6 Marlborough because of taxes and penalties due from Louis Shaw on the still and illegal spirits. He subsequently paid the fees under protest and the lien was removed on January 23, 1922. On September 9, 1923, the Boston Globe reported that he had filed suit in Federal District Court to be repaid the amount he had paid and to recover the still and spirits. Louis Shaw continued to live at 6 Marlborough during the 1923-1924 winter season, after which he moved to an apartment at 301 Berkeley. On May 26, 1924, Edward Wyner purchased 6 Marlborough from Louis Shaw. The house was razed in August of 1924.